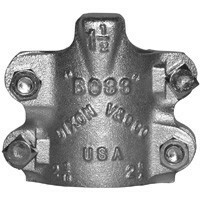 # DIXB25 - Boss Clamp - 4-Bolt Type - 2 Gripping Fingers - Plated Iron - Hose ID: 1-1/2 in. - Hose OD: 2-36/64 in. to 2-48/64 in. Hose OD 2-36/64 in. to 2-48/64 in.